Antique lamp that gives 200 XP in a skill of your choice. Speak to Dororan the dwarf outside Barbarian Village [map]. 1. To start the quest, speak to Dororan, the dwarf just outside Barbarian Village [map]. He will start to recite a poem, and you will have to complete it. It does not matter what you say to him, you will start the quest regardless of the options you choose. 2. You need to speak to Jeffery, who is in Edgeville. 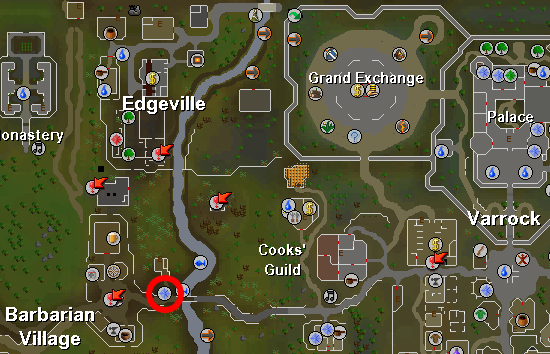 Head north to get to Edgeville, and go to the house with a furnace east of the bank, where you will find Jeffery. Ask him about the gold ring. Again, pretty much anything you say will give you the ring. 3. Head back to Dororan once you have the ring. He tells you to use a chisel to engrave his words onto the ring, so ask him if he can give you one. Use the chisel with the gold ring to engrave the words onto the ring. 4. Once you have the engraved ring, speak with Dororan again. He will now ask you to take the ring to Gudrun for him. 5. Gudrun is walking around in the middle of the village. Give her the ring. She will tell you to speak with her father, Chieftain Gunthor. 6. The chieftain is located in the longhouse north in the village. Unfortunately, he is not very accommodating, so head back to Gudrun. Once you've found the correct words, you will receive the poem. 8. Bring the poem to Gudrun. She will recite it to the chieftain. A cutscene will appear, and the chieftain will announce that they are no longer at war and Dororan is welcomed as the village's poet. Congratulations, you've completed the quest! 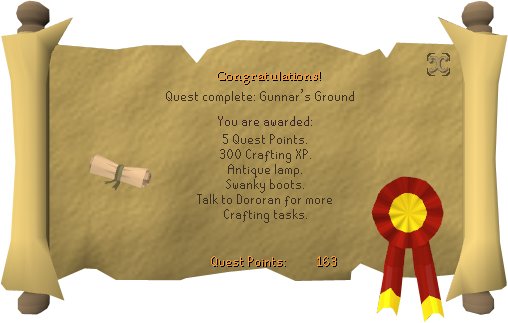 Note: If you've completed the quest Romeo and Juliet before the quest was removed, then you will not get quest points from Gunnar's Ground (because Gunnar's Ground was intended to replace Romeo and Juliet). The warlod Gunnar leading to the east. In Gunnar's bloodlines, fierce to this day. And Gunnar's blood with beauty also blessed. And let this be the time of Gunthor's peace.